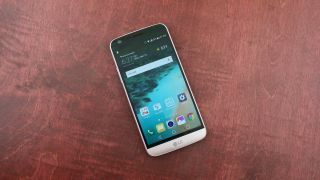 Rumors have so far suggested that the LG G6 will have a 5.3-inch screen, but it seems those rumors are wrong, as LG Display itself has now said that it’s sticking a 5.7-inch QHD LCD screen on the company’s next smartphone. That’s a significantly bigger screen than the 5.3-inch one on the LG G5, and would put the LG G6 more in line with the LG V20. But it’s not just the size that’s different, it’s also the aspect ratio, as this new display will be 18:9, making it more widescreen than most phones. The panel, dubbed QHD+, will apparently provide greater immersion than previous LG displays and make multitasking more viable. It will have a resolution of 1440 x 2880, making for a pixel density of 564 pixels per inch, and it will use LG’s in-TOUCH technology, which embeds the touch sensor inside the LCD cell for better touch performance. The screen will also have slightly smaller bezels than the LG G5’s display, with a reduction of 0.2mm on the sides and 0.54mm at the bottom, so it’s likely that the LG G6 will have a higher screen-to-body-ratio than the G5. Finally, this QHD+ display is said to be easier to view in sunlight, and 30% less power hungry, which could translate to longer battery life. It’s worth noting that it’s not 100% clear whether this screen is coming to the LG G6, as some sources are saying it’s just heading to LG’s “next smartphone”, but The Korea Herald – one of the originators of the report – claims LG Electronics said the G6 specifically will be getting this screen. In any case it’s hard to imagine another upcoming LG phone getting such a top tier display.